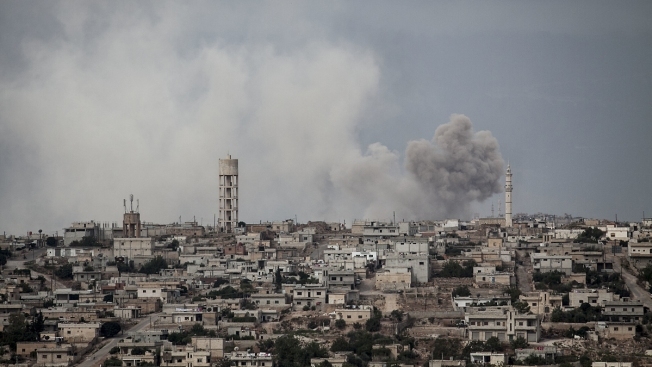 In this Sept. 19, 2013, file photo, smoke rises after a TNT bomb was thrown from a helicopter, hitting a rebel position during heavy fighting between troops loyal to President Bashar Assad and opposition fighters, in a neighbouring village to Kafr Nabuda, in the Idlib province countryside, Syria. The campaign for Idlib, the opposition’s only remaining stronghold in the country and now a refuge for over one million displaced Syrians, is likely to be the last major theater of battle after seven years of brutal civil war. The debate now appears to be about when, not whether, to re-admit Syria to the Arab League. At a meeting in Cairo on Wednesday, Egyptian Foreign Minister Sameh Shukri said Syria's return to the League is connected to developments on the political track to end the crisis. Some officials in Lebanon insist Syria should be invited to an Arab economic summit the country is hosting next week, although final decision rests with the League.